This is a really big month at BlogAid. First, it’s the start of the busy season for everyone who does any type of site work. I usually don’t come up for air until about March. This weekend I got caught back up with all my client projects that were already open and at a good stopping point for my house moving. We’re about to wrap up all of them. Sunday I on-boarded six clients from all of the requests that poured in during September. Most of those are folks who wanted to wait until October to get started. And some we’re almost finished with already as they were loyalty audits from previous site audit clients or quick site tech work projects. So, if you’re getting ready for any type of site work, don’t hesitate to get on my wait list. It fills up fast this time of year. This past week I worked with a site audit client who had questions about some of the things she was seeing in Google Search Console on the new interface. The graphs made it look like something super serious was wrong with her crawl settings, as there were hundreds of pages that were marked noindex. Right, we set them that way on purpose in the Yoast SEO plugin, for things like the date and author archives. But, until you get familiar with the new interface, it will make you think you have all kinds of issues on your site. And that’s why I’ve become a tutorial making maniac to get this new course launched for you. I have permission from this client as well as another to take screenshots of their graphs, as they have way more activity on them than the little site I’ve been using to make the tutorials. That way you’ll have good examples of what right and wrong look like on those graphs so you’ll know if you have a site issue or whether you’re just being given info that you can pretty much put on ignore. And I will say we sure have seen a lot of useless info from Google lately. Most of the email alerts we’ve been receiving are totally bogus or a waste of time. I can’t say that I’m a fan of this new interface, but I do know they will continue to tweak on it as they receive feedback from users like us. I’ll keep you posted when the first part of the tutorials with the tour of the new interface hits the DIY SEO course. And, I’ll be running specials around that time too. So keep an eye out for those. I know a lot of you are about to renew too, so be sure to check your renewal anniversary date. It’s in the top box of your member dashboard, no matter which membership you’re in. Be sure to mark your calendars for that renewal reminder, as the plugin I use won’t allow me to send reminder emails. I was pretty ticked to discover that when I switched over from a flat fee course to annual subscriptions. And I’m bugging the stew out of the devs to add that feature. I’ve seriously considered moving to another membership platform over this, but that is a huge job that I know I won’t have time to look into until at least spring. This weekend I sent out a quick challenge for my Site Audit Plus clients. Those are site audit clients who also joined our exclusive Facebook group and member site for free. We’ve been doing these quick checks and challenges about every week or so and they are really empowering DIY site owners to keep their sites squared away. And this time we did one on documenting your site changes as you go. I do that for all client work and for all of my sites too. Really helps if you need to retrace steps later when you find that something went wonky on your site, or at your next annual check up audit. That helps me identify any orphaned files/folders/database tables that may have been left after you changed plugins or themes during the year too. So, if you’re ready to be an empowered DIY site owner, come get your audit and all the goodies like our group and member site that just keep on giving. During my site and theme revamp project this past summer, I deleted a bunch of old pages and reorganized resources to help you find info on BlogAid. Have you checked out the Helpful Posts page lately? You’ll find it as a sub menu under the Blog and under Resources too. I’ve been steadily adding my most popular and helpful posts to it for several months. They are divided out by category too, so that makes finding what you’re looking for fast. I’d appreciate your help with which posts you find most helpful. If you ever do a Search on BlogAid, let me know about it and I’ll be sure to include the post that answered your question. Google continues to make improvements to Google Images. This time it was an algorithm update that you really need to pay attention to. For now, go read the article on SEO Roundtable. And we’ll be discussing this more in-depth during tonight’s live recap about republishing posts for freshness, and page authority, plus the role of your Pinterest images in all of this. And there has been another big change with Google Images this past week. Google is now including more creator metadata and will soon roll out copyright metadata inclusion. Here’s their official post and here’s the post on SEO Roundtable with their take on what it may mean. This is clearly meant to help pro photographers and artists. Metadata can slow down your page load time, it’s one of the things that the image tutorials I reference so often suggest that you strip out. However, most of that metadata is camera and lense info that you don’t need to be sharing anyway. Y’all use all manner of tools for optimizing your images. So I don’t have a single best practice to recommend for adding things like the copyright. I’m not sure adding the creator metadata is worth it, but I don’t think these two items will increase your file size much. So, look in the programs you use, like Adobe Lightroom, which is one of THE best programs if you’re coming straight out of a camera shot, and see what metadata it allows you to control. And do let us know what Canva offers, as I know a lot of you use that too for putting in your text and such and I don’t know if it retains any metadata you may have input with another program. Please do leave a comment with your thoughts and I hope you’ll join us this evening for a live discussion on this. Google just turned 20 and had a small ceremony to celebrate where they recapped the paradigm shifts search is currently undergoing, and where it’s headed in the future. This post on the Yoast blog is a great overview. And here’s another on Social Media Today with a slightly different take. I want to point out a couple of highlights to help you break away from your keyword placement habit and get with the new way to get your content to rank well in search. AI – Artificial Intelligence – that’s the whole future of search, and it’s already at work now. Instead of looking for a specific keyword in a specific place, Google’s AI can pick up the gist of the article directly from the content. And even though the exact keyword that a searcher queried may not be in your title or meta description, that may indeed be the gist of your content. And that’s what Google will show in the search results. Keywords still have their place, but they are not what search ranking relies heavily on anymore. It’s all about E-A-T now, which is Expertise, Authoritativeness, and Trustworthiness. Writing super content on specific topics is what’s going to draw Google’s attention. All the techniques I teach in the DIY SEO course are to help Google become aware of that fact and ensure your authoritative posts get noticed by the search bots. But, the bottom line is, you can do all SEO techniques in the world exactly right, but if your content is subpar, it won’t matter. Your post may get indexed, but it just won’t rank highly. I own the domain Blog On Purpose. It’s connected to a test site right now. But, I used to teach a course on content creation. I’m seriously thinking about bringing that back. Maybe after we finish our new live workshops this winter and spring, we can think about adding that as a new workshop for the summer. In the meantime, do jump over to the Yoast blog and read this post so you can wrap your mind around how search has changed and what you need to do to get your thinking and practices in line with those changes. Due to the prominence of recent Facebook court cases and GDPR laws, everyone is getting more sensitive about their online privacy, which is actually a good thing. Big Brother, also known as Google, is definitely watching your every move, literally, via its Map app. Hongkiat published a post on how to take control of Google’s surveillance of your online activity. It includes turning off personalized ads. Now, I don’t know how this will impact AdSense ads for you. An ad will likely still show on your site, but for visitors who have the personalization feature turned off, it’s hard to say what ads they will be shown. Less personalized likely means less clicks. On the upside, maybe they will start displaying ads that have something to do with your niche instead, and are closely related to your content. Was your Facebook account affected in the latest data breach last week? Here’s the official word on it from Facebook. Users who were affected were auto logged out and should have seen a message at the top of their feed about why. So, if those things didn’t happen, you likely weren’t affected. They are also saying that changing your password now is probably a mute point, but that’s never a bad idea. The story has gotten worse in that Ireland’s Data Protection Commission is demanding more details about the leak, and they threatening a fine to the tune of $1.63 billion for GDPR violations of not taking adequate precautions to safeguard user data prior to the breach. No matter which way this thing goes, it’s a clear warning to all social media that they better get serious about personal data and security, which is a big boon for us users. 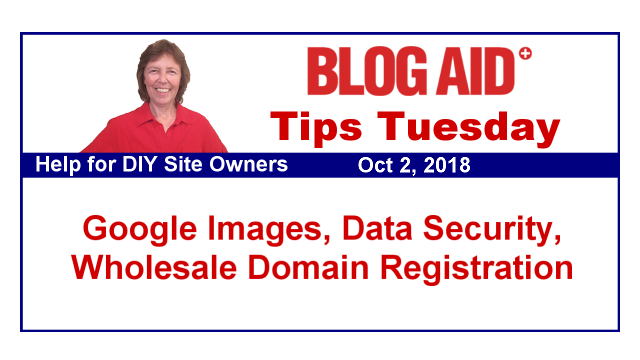 And this should also be a huge wakeup call to site owners to get super serious about their own site security and 3rd party vendors with whom they share info – like an email list service provider. You want to be sure your HTTPS connection is solid before anyone gives their email address to you. Plus, think about all the comments on your site. Those emails are held in your database. If your site gets hacked, that’s exactly the kind of stuff they are after – known good emails. Those things are like gold on the black market. If you haven’t had a site audit yet – get one. If it’s been over 18 months since your last audit, schedule a check up, as security has changed, especially this year. You may recall in last week’s Tips Tuesday that I reported Cloudflare turned 8 years old and they were celebrating with gifts for us all week. One of the biggest announcements was the new Cloudflare Registrar for domains. They are making domain names available at wholesale cost plus they will offer free WHOIS privacy. Talk about saving you money!!!! A few months ago, during the whole GDPR hoohaa, Namecheap decided to offer WHOIS privacy for free too. That will save you about $9/yr per domain. I didn’t jump ship from GoDaddy over that as my domains came up for renewal, but I likely will for this new Cloudflare Registrar offer when it becomes available. Right now, you have to register for early access. And, I’ll be keeping my eye on this to see how their interface works by moving one domain over, or asking my Webmasters to share a screenshot and give a review of it if they jump before I do. Sometimes discount registrars have awful interfaces and make it super hard to manage your account and DNS, so they really aren’t much of a bargain if they cost you extra tech or admin time. In fact, folks who use junky registrars get charged way more by me than the yearly fee for the domain if I have to spend a bunch of time figuring out how to use the service to do simple things like point the DNS to Cloudflare or do a domain forward or such. So, it’s not all about cheap pricing, and I’ll keep you posted on how it works out. For now, I’m still recommending NameCheap and then GoDaddy as your best bets. I use Canva for Work all the time and love it. My main image editor is Photoshop Elements which optimizes my images when I “Save for Web”. (Most of my images are book covers.) I upload those to Canva for my social media graphics, category buttons, etc. Canva for Work has additional features that I can’t live without: Brand Kit management (colors and logos). Magic Resize (resizing one graphic for different social media graphics). Multiple Design Folders (when you have several websites). Download designs with transparent backgrounds. You can also make PDFs with Canva–great for making branded pages to share or Ebooks. That sounds like a good combo Harriet! Do you have control over any metadata with those two? I haven’t added metadata with either, but pretty sure Canva can’t. I looked at my Photoshop Elements (an older version), and it has ways to add info under the “File Info…” setting. The only documentation I found on Canva was for using Gimp to embed metadata it to images for sale on Canva. (https://support.canva.com/contributors/embed-metadata/embedding-metadata/) That tutorial might be useful to add basic info to an image. Thanks so much for the tutorial Harriet!! I wonder if you add the metadata in Elements and then edit the image in Canva, whether the metadata will remain. That would be the test to run. I checked a few of my Canva images in Photoshop Elements. The “File Info…” settings in Photoshop Elements show zip, nada, nothing. Then I uploaded a photo with basic settings, created a Canva image with it and downloaded it. That has to be useful for loading speed. I always check my downloaded Canva images in Photoshop Elements making it easy to add metadata if desired for an original image. Thanks for the report Harriet. One of the big issues here is that every time you save it in a different program, it probably gets compressed again, and that can lead to fuzzy or lower quality images. The metadata would have to be present in the last step of the process. Great post! I thought the cloudflare domain sounded good…but I also knew I better wait and see what MaAnna had to say about it! I sure hope that new Cloudflare domain interface is good because this is a super deal!!!! I’ll keep you posted on what I find when it becomes available. Thanks, as always, MaAnna. I’ve shared on social media. I also wanted to let you know that I mentioned BlogAid on my 3rd Blogiversary post today. Thank you so much Christie!!!! I appreciate you helping more bloggers get empowered to do well with their sites!!! I know you take good care of your clients too! !